purchases must be made on either August 11 or 12, 2018. Prior sales, layaway sales, and sales of telecommunications services, tobacco products, gas, steam, electricity, motor vehicles, motorboats, meals, and items priced over $2,500 are exempt from the holiday and will remain subject to the sales tax. 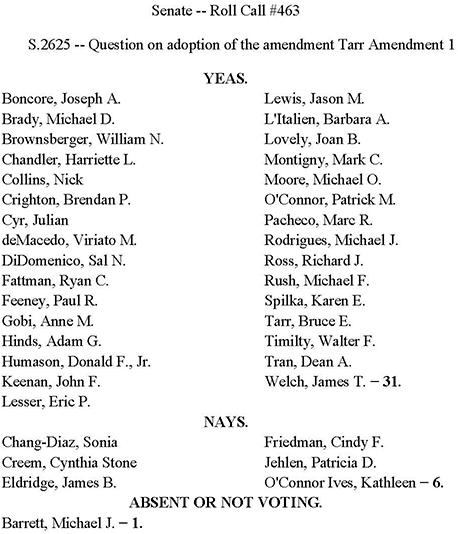 Adoption of the Sales Tax Holiday amendment in the Senate was not the only victory for RAM members during the debate. RAM had urged senators to reject Amendment #2, relative to Blue Law Premium Pay in retail, which sought to overturn our recent victory in the “Grand Bargain” legislation where we won a repeal of the retail-only requirement that employees be paid premium pay on Sundays and holidays. We were pleased that the amendment was withdrawn, but on alert that a legislator would seek so early to go back on a deal negotiated in good faith. The two branches will now need to work out the differences between their legislative proposals before finalizing and getting one bill off to the Governor prior to the end of Formal Sessions on July 31st.